Summer has come and gone here at Gracepoint Berkeley, and suddenly, New Student Welcome Night (Aug. 26 & 27) is only two weeks away! 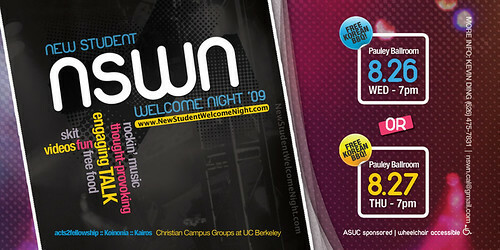 For those who don’t know, NSWN09 is the must-go event for new students every fall Welcome Week on the UC Berkeley campus. Sponsored by Koinonia, Acts2Fellowship, and Kairos Christian fellowships, NSWN09 is a night of rocking praise, videos, skits, and a thought-provoking message. So if you know anyone coming to Cal this fall, tell them to come! Here’s a video trailer for the event.